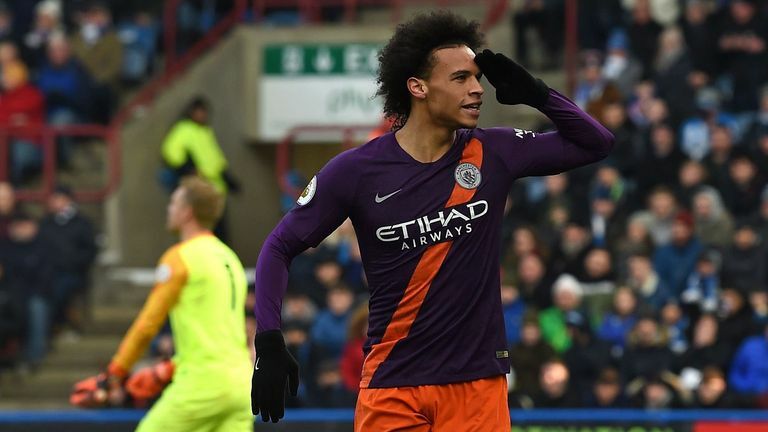 Manchester City breezed past managerless Huddersfield 3-0 on Super Sunday, closing the gap to league leaders Liverpool back to four points. Goals from Danilo (18), Raheem Sterling (54) and Leroy Sane (56) did the damage as Pep Guardiola's men have now scored 22 times in their last four games in all competitions. This was Huddersfield's first game since David Wagner departed and 23 pages in the match programme were dedicated to his tenure, with a video message from him played to the fans at half-time. Mark Hudson was in temporary charge but he was unable to spark the hosts into life. Another blank means the Terriers have only scored 13 Premier League goals this season - the fewest in the top four divisions. They remain 10 points from safety. City came into this game having scored 99 goals in all competitions and it took them just 18 minutes to reach three figures. Danilo drove forward from full-back and struck a shot that took a wicked deflection off Christopher Schindler, with the ball flying into the corner of the net. 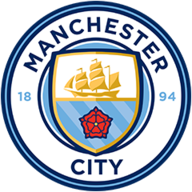 Nicolas Otamendi, Ilkay Gundogan, Kevin De Bruyne and Sergio Aguero came in for John Stones, Bernardo Silva, David Silva and Gabriel Jesus. 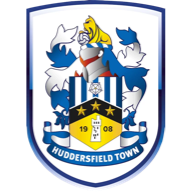 Meanwhile, interim Huddersfield boss Mark Hudson rang the changes, bringing in Tommy Smith, Terence Kongolo, Juninho Bacuna, Adama Diakhaby, Chris Lowe and Isaac Mbenza. The game started to drift for the remainder of the first half but Guardiola must have had words at the break as City came out with renewed energy. The champions went from first gear to fifth in a devastating two minutes of ruthless attacking, where Sterling and then Sane found the net. Sterling finished off a flowing move instigated by Kevin De Bruyne and assisted by Sane, although the German did look marginally offside. Just 90 seconds later Sergio Aguero nodded through Sane, who remained calm and skilfully finished from close range. The three-goal lead allowed City to operate in the comfort zone for the remainder of the game - and Huddersfield had no answers. He floated in and out of the game but when he was at the forefront, Sane took Huddersfield apart. He's now scored seven goals and grabbed nine assists in his last 17 Premier League appearances. Gary Neville on co-commentary said: "The first 20 minutes he looked dangerous and then after the break he came to life, setting up Sterling and then scoring himself. He's a player - as a right-back - I would hate coming up against." Since losing 2-1 to Leicester City on Boxing Day, Manchester City have won their last six matches in all competitions by an aggregate score of 27-2. Huddersfield Town have lost five consecutive home league matches for the first time since a run of seven defeats in a row between April and September 2000. Manchester City became the first team in Europe's top five leagues to score 100 goals in all competitions this season (102). Sané has had a hand in 20 goals in his last 17 Premier League starts (8 goals, 12 assists). Huddersfield have won none of the 34 Premier League games in which they've conceded the first goal (D3 L31), losing all 14 home games when conceding first. Sterling's last two Premier League goals have been headers - only one of his first 57 in the competition came via his head. Since the start of last season, Huddersfield have failed to score in 32 Premier League matches - nine more than any other side. Sane and Sterling have combined for six Premier League goals for Man City this season - the only duo to combine for more are Bournemouth's Callum Wilson and Ryan Fraser (seven goals). City face Burton Albion, live on Sky Sports, on Wednesday in the second leg of their Carabao Cup semi-final, with a 9-0 aggregate lead already in the bag. Meanwhile, Huddersfield's next game is in nine days when they host Everton in the Premier League.